Donald Trump, left, and Marco Rubio during a commercial break at the CBS News Republican presidential debate at the Peace Center on Feb. 13 in Greenville, South Carolina. If it’s not obvious by now, a ship called the Republican Party is perilously close to being hijacked by a populist pirate named Donald Trump. At the last three ports of call — New Hampshire, South Carolina and Nevada — Trump overpowered his rivals, even capturing all 50 of the Palmetto State’s delegates. Armed with a blue-collar following, Trump could continue to win majorities of delegates without winning majorities of voters, and if he does, he could become unstoppable in as soon as three weeks. Yet there is still a possibility, albeit a narrowing one, that Marco Rubio could turn the tide and ultimately win more delegates than Trump — even if he wins fewer overall primary votes. Rubio’s increasingly tenuous path depends on his ability to win a series of winner-take-all states with high proportions of white-collar, college-educated Republicans, most critically his home state of Florida on March 15. Rubio’s path may also depend on his ability to claim delegates from low-turnout territories like Puerto Rico (which, amazingly, will select the same number of delegates as New Hampshire despite having a fraction of the GOP voters) as well as blue-leaning congressional districts with few GOP voters but many available delegates, such as those in Chicago, Maryland and coastal California. In each instance, Rubio might hope to win large delegate margins with relatively small raw vote margins, while Trump wins far more votes elsewhere but reaps more modest delegate payoffs — raising the prospect of an unusual split votes/delegates verdict enabled by the GOP’s uneven delegate allocation rules. However, to move beyond wishful thinking and achieve such tactical victories, Rubio will need to consolidate much more of the non-Trump vote and rapidly grow his support in Democratic-leaning areas in an extremely compressed window of time. That’s a tall order, but it may be GOP leaders’ last hope to stop Trump, who clearly has the best chance of winning the nomination outright by the final primaries in June. The problem for Rubio with this scenario: With less than a week before 595 delegates are awarded on Super Tuesday, Republican voters in blue and well-educated areas are sending mixed signals. Rubio’s team can draw encouragement from Iowa and South Carolina, where his geographic patterns of support looked strikingly similar to Mitt Romney’s in 2012. Despite finishing third in Iowa, Rubio performed admirably in the state’s Democratic-leaning metro areas and well-educated suburbs, carrying five of the state’s 10 most populous counties. In South Carolina, Rubio won Charleston and Richland counties, among the largest, bluest and best-educated in the state. 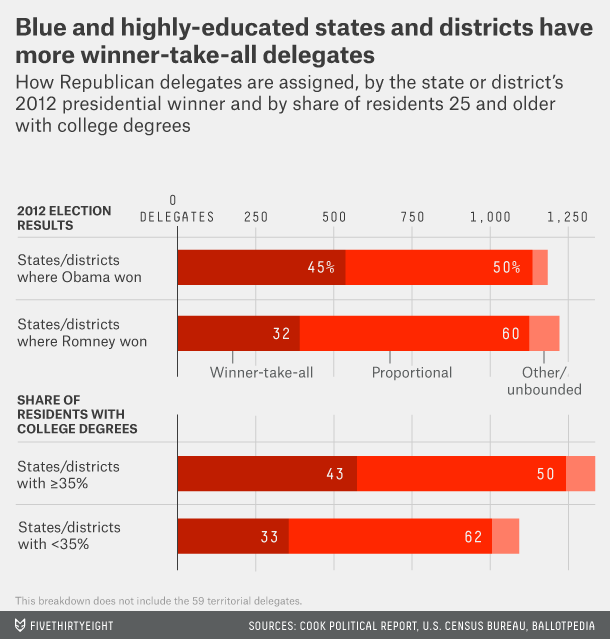 This pattern would seem like a blueprint for Rubio to win Northern and well-educated states, much as Romney did. But Rubio’s curiously anemic polling in several blue states Romney carried during the 2012 primaries casts doubt on the feasibility of such a blueprint. Over the weekend, an Emerson College poll of Massachusetts GOP primary voters showed Trump with an enormous lead, 50 percent to just 16 percent for Rubio, 13 percent for John Kasich and 10 percent for Ted Cruz. And a Quinnipiac poll in Ohio, which hosts a March 15 winner-take-all primary, showed Trump leading with 31 percent to 26 for Kasich (the sitting governor), 21 percent for Cruz and just 13 percent for Rubio. The latter finding underscores how much Kasich’s continued presence in the race undercuts Rubio’s bid to stop Trump. Trump’s support appears geographically broad, with blue-collar voters powering him to victory in Northern, Southern and Western states. In fact, his sweeping victory in heavily evangelical South Carolina may have obliterated Cruz’s mathematical path to the 1,237 delegates required to clinch the nomination. And Cruz’s recent demise as a top contender may in turn heighten Rubio’s challenge: The more Trump dominates the SEC Primary states on March 1, the more delegates Rubio will need elsewhere to overtake him. After March 1, 52 percent of Republican delegates will be awarded on a winner-take-all basis, keeping alive the possibility that a large early Trump delegate lead could be erased quickly by modest losses later. March 15 is truly the GOP’s “day of reckoning,” and Florida may be the most pivotal state on the entire calendar. If Trump defeats Rubio in his winner-take-all backyard, it would be game over. But if Rubio wins over enough of Jeb Bush’s old supporters to claim Florida’s 99-delegate jackpot, it could mark a long-awaited turning point in the race. At the very least, he could leverage such an outcome to try to prevent Trump from winning a majority of delegates by June. The continued candidacies of Cruz, Ben Carson and Kasich are of great significance even if none of them any longer have a credible path to the nomination. The more delegates they siphon off on Super Tuesday and beyond, the greater the odds neither Rubio nor Trump racks up 1,237 delegates by June, raising the prospect of a multi-ballot Cleveland convention in July. And what could possibly compound the chaos of a contested convention? Just imagine a convoluted scenario in which Trump winds up with fewer delegates than Rubio despite having won the most votes heading into a contested convention, while Cruz and Kasich delegates are the ultimate arbiters of the nomination on a second or third ballot. Cue an angry press conference at which a red-faced Trump accuses the Republican National Committee of fixing the rules against him and thwarting the will of GOP voters. But the RNC’s rules predate Trump’s rise, and they may be party leaders’ only hope of averting a likely Trump shipwreck in November.